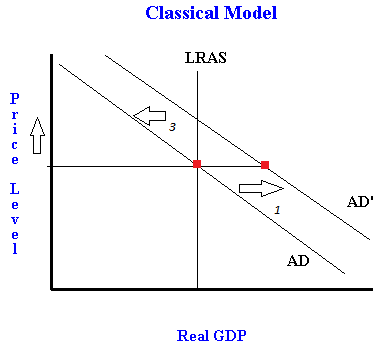 How a shift in Aggregate Demand affects the classical model (long run aggregate supply) - FreeEconHelp.com, Learning Economics... Solved! 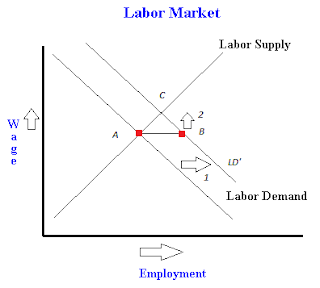 Starting with the economy at full employment (equilibrium in the labor market), aggregate demand increases. This can be caused by any of the factors that determine demand (consumption, investment, government, or net exports). For this example, let's assume government increased their spending. This causes AD to shift to AD'. Notice that in the very short run, real GDP increases, and the price level remains constant. The increase in aggregate demand causes Real GDP to rise above its long-run level, which is represented by the vertical LRAS (long run aggregate supply) curve. 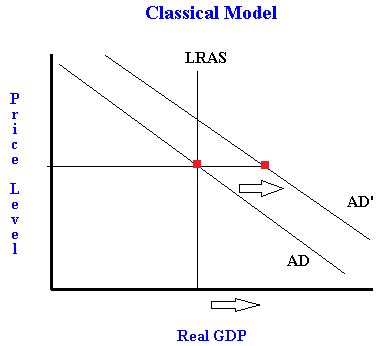 Remember that a shift in AD does not mean that we have to shift the LRAS curve. Since we are no longer in equilibrium, something has to occur to get us back to our long run aggregate supply curve. This occurs in the labor market. 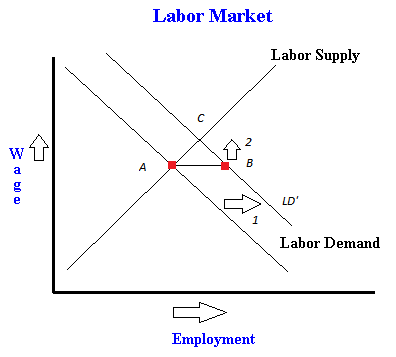 Because of the higher level of real GDP, we see labor demand shift right (from Labor Demand to LD'). 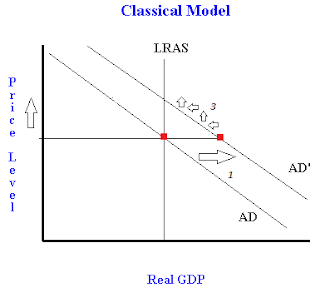 Firms demand more labor because they are trying to acquire the labor necessary to produce the amount of real GDP required by the classical model. This means that unemployment or underemployment decreases due to the higher level of real GDP. This is represented by the gap present between points A and B. Since there is a gap, wages must rise over time to get us to equilibrium again. This happens (represented by arrow with the 2 next to it) to get us to equilibrium point C. Notice that at point C both equilibrium wage and employment have gone up. However, as wages go up, employment is going down. 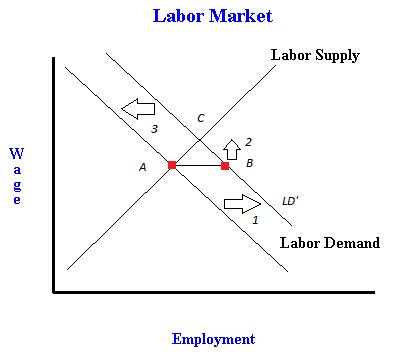 Employment going down causes real GDP to fall, and as this occurs, the labor demand curve begins to shift back left. This is represented by the arrow with the 3 next to it. The shift keeps occurring until labor demand is back to its original position with the original equilibrium values. As the price of wages increased, we will see that same increase in price occur in the aggregate demand and aggregate supply graph. As employment decreased, we see a corresponding decrease in real GDP on this graph. The arrows with the 3 next to them show how we move along the AD curve back to LRAS as the labor market also re-approaches equilibrium. Eventually we will attain a new equilibrium where AD' and LRAS cross. At this new equilibrium point, real GDP will be the same, but the price level in the economy will be higher. This is why classical economists argue against aggregate demand stimulus for an economy. Their argument is that it will only result in inflation, which itself is bad. Note that if you have a decrease in AD, the same story holds except labor demand shifts left, and wages fall... etc.